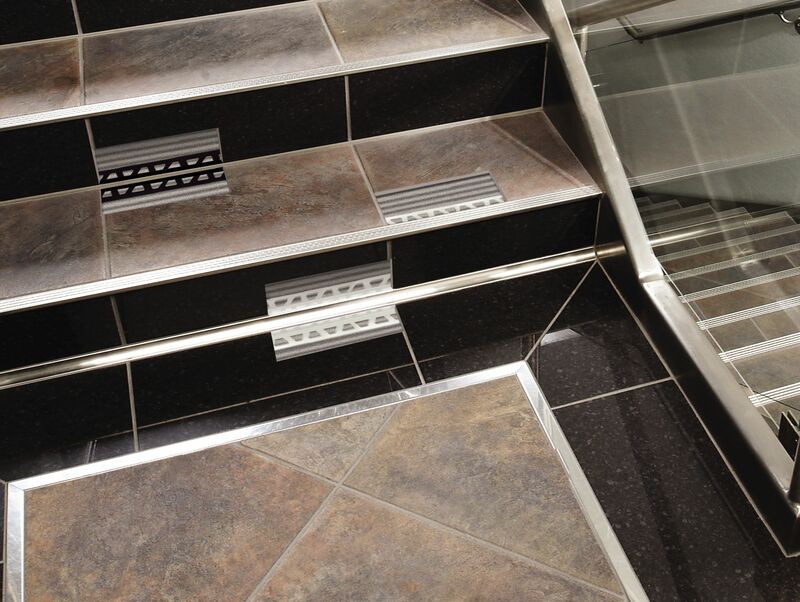 The durability of tiles makes them a go-to choice for commercial and residential stair applications alike. 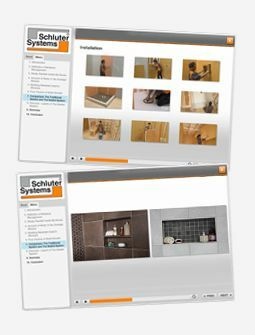 Tiles require little cleaning maintenance, so are ideal coverings for these high-traffic areas. Continue tile from the entryway up the stairs for a cohesive look, or make a statement by tiling the risers on the staircase in a creative, bold pattern. With tiles, stairs can add flair to any room! Safety can also be maximized on tiled stairs by incorporating profiles to reduce slipping hazards and increase visibility. Profiles can help achieve a slip-resistant wear surface on the stair’s surface, or can cover the top of the stair riser to make each step stand out. 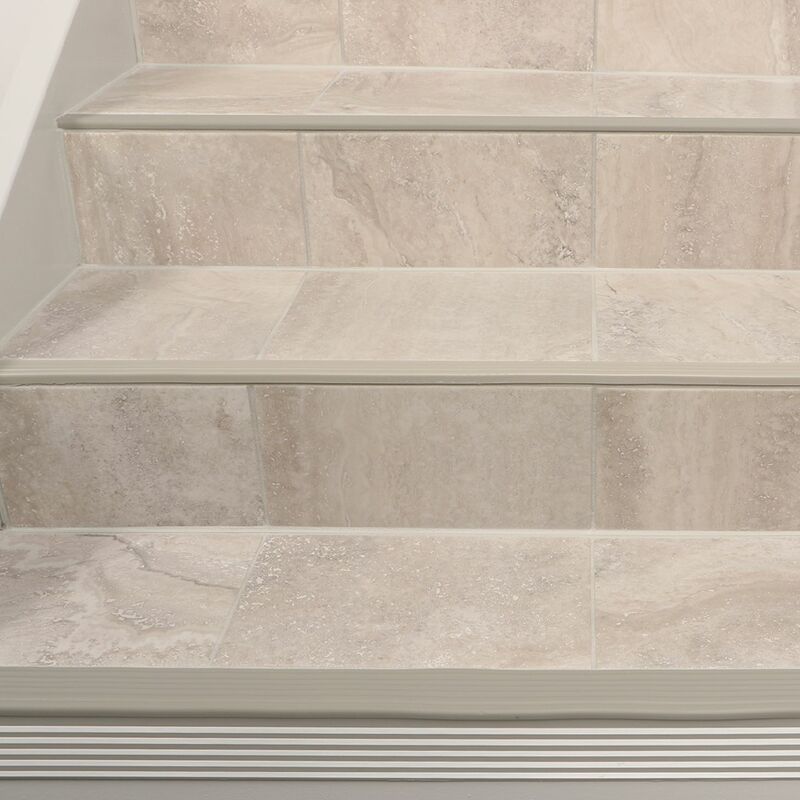 Profiles can also simply be incorporated into tiled stairs for a decorative touch. 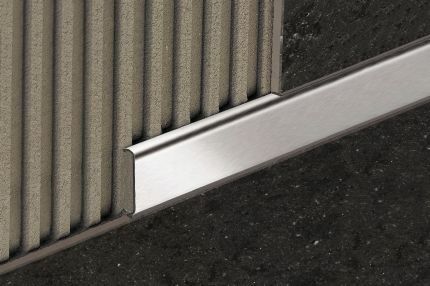 Made in stainless-steel, the TREP-E stair nosing profile offers a resilient and slip-resistant wear surface—ideal for high traffic areas. 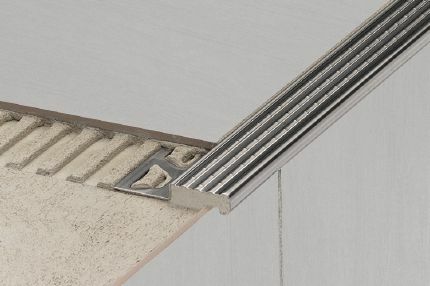 Positioned between the stair and riser is the DILEX-EKE, a corner movement joint profile. The DILEX-EKE features a soft CPE movement zone that is available in a variety of colors to match grout color. 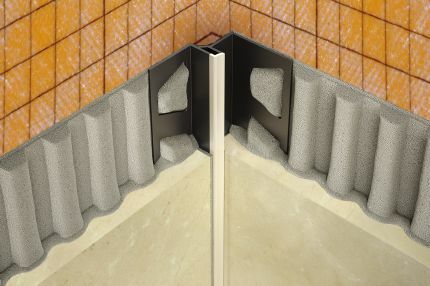 DILEX-EKE prevents surface water penetration and prevents sound bridges, making it ideal for sound-rated floors. 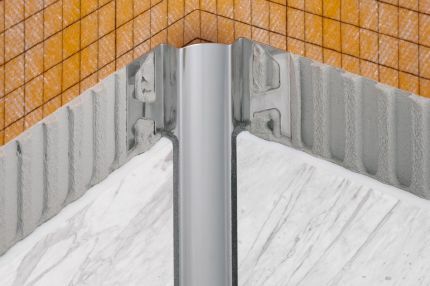 Cove-shaped profiles make for easy-to-clean transitions and eliminate the need for grout between floors and walls. In this case, DILEX-EHK seams the gap between the landing and first step. The profile is made of stainless steel, and therefore resilient and hygienic—ideal for places with strict sanitary requirements. Various accessories are available. Featured here in stainless-steel to match the DILEX-EHK, DESIGNLINE is used to complete tiled staircase at the landing. This decorative border profile features a 1” (25 mm)-wide visible surface to add an element of elegance. A variety of stair-nosing options is available to suit your style and the needs of your project.